Everyone still can remember miracle-plane-crash with all passengers and crews survived, which happened a year ago. 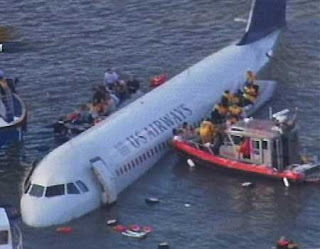 That was a US Airways Flight 1549, which amazingly crash-landed into extremely cold Hudson River of New York on January 2009. Now it is up for auction by Chartis Insurance which is a division of the American International Group Inc. The Airbus A320-214 aircraft, is listed for sale "AS IS/WHERE IS", at a salvage yard in Kearny, New Jersey. The auction is open to public and is schedule to close at March 27 2010 4:30 p.m. ET. This short report is prepared by lynnnayko. No Comment to " "Miracle on the Hudson" is now up for auction "